San Diego has received a national public relations award for an event celebrating the pioneering use of recycled water to make beer. The Public Relations Society of America recognized the city’s Pure Stone event last year with an Award of Excellence for Events and Observances, Seven or Fewer Days forAssociations/Government/Nonprofit Organizations. The award was presented at the PRSA Silver Anvil Awards Ceremony on June 7 in New York City. Last year, the city partnered with Stone Brewing to brew beer using 100 percent advanced-treated recycled water from the city’s Pure Water Demonstration Facility. The limited-edition beer, named Full Circle Pale Ale, was served at an event hosted at Stone Brewing World Bistro & Gardens in Liberty Station. Nearly 250 community leaders attended the event to taste the beer and celebrate the partnership. Mayor Kevin L. Faulconer proclaimed March 16, 2017, “Pure Stone Day” in San Diego. 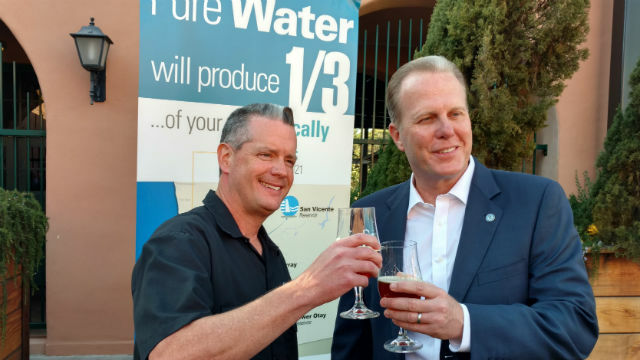 The event marked the first time a commercial brewery brewed beer with 100 percent advanced-treated recycled water, and the project garnered headlines across the country and internationally. The partnership’s shared commitment to sustainability and ingenuity helped the city earn its reputation as a leader in potable reuse nationwide. The Pure Stone event has resulted in six awards from various industry associations including the Water Reliability Coalition, California Association of Environmental Professionals, California Association of Public Information Officers and PRSA. Pure Water San Diego is a phased, multi-year program that uses proven technology to clean recycled water to produce safe, high-quality drinking water. The Pure Water Program will provide one-third of San Diego’s water supply locally by 2035.